Three letters, one message: The second edition of the Porsche 911 Carrera GTS is the symbiosis of Carrera S and GT3. Scarcely any sports car is more multifaceted, more varied, more broadly positioned than the Porsche 911. 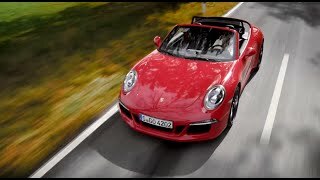 The palette ranges from that style icon of the generations, the Coupé, to the recently unveiled Targa with its characteristic Targa bar, from the models with manual transmissions and naturally aspirated engines to the winged top-of-the-line Turbo with all-wheel drive and double-­clutch transmission (PDK). In spite of the tightly arrayed lineup, the technical evolution continually carves out new niches in which the rear-engine classic, often in limited production runs—visually expressive and decidedly powerful—surpasses itself once again. These shooting stars, which have contributed greatly to the legend, include variants such as the Clubsport, RS, GT2, GT3, Speedster, and GTS (Gran Turismo Sport): extra-spicy 911s, one and all. Step in, take a seat, and buckle up for the first outing. The center section of the sports seat is covered with black Alcantara—reminiscent of the GT3. The same material is used on the steering wheel rim, the gear lever, the door handles, and the covers of the side storage compartment. Alcantara is lighter than leather, a stalwart of the racing milieu, and characterized by its inimitable haptics, that science of applying tactile sensations. Black-trim rings and doorsills as well as the black headliner complete the sporty ambiance. For other tastes there are additional color and material options, naturally, including Porsche Exclusive options. The GTS has the wide body of the all-wheel-drive models. Here, too, black dominates as the sporty accent color. The interior of the Bi-Xenon headlights with the Porsche Dynamic Light System (PDLS) is tinted, as is the redesigned rear lid grille, the side skirts, the 20-inch Turbo wheels with central locking, the exhaust pipes and apron, and the new strip between the rear lights of the GTS models with rear-wheel drive. All-wheel versions feature the red reflector strip. For this 911 engine as well, the tone says it all. Though lacking the whistle and growl of the Turbo, it is a more sonorous and, above 4,300 rpms, even more intense sound. Thanks to the Sports Exhaust System, it is considerably more present, and accompanied by a broader range of revving nuances. With its valve-control system, the Carrera GTS produces an even more striking sound when accelerating or coasting, but even during shifting it never sounds flat or vulgar. “We’ve thoroughly reworked the engine’s breathing apparatus; that’s why you can recognize the GTS by its unique sound,” explains Krickelberg, power­train project manager for the 911 model line. “When the valve on the air collector opens at 4,300 rpm, it has as much of an impact on the sound as adding the second intake duct at 6,300 rpm. Over the last 1,200 rpms there is noticeably more power at one’s disposal—producing 316 kW (430 hp), this variant has upped the ante by 22 kW (30 hp) over the Carrera S and the Carrera 4S. At the same time, the torque curve remains consistent for a longer period at its peak of 440 newton-meters. “The GTS engine combines the elasticity of the Carrera S with an additional burst of power in the peak performance range,” says Krickelberg. The 911 Carrera GTS and the Carrera 4 GTS with PDK do the zero to 100 km/h sprint in just 4.0 seconds. But when you’re talking about emotion, numbers are just smoke and mirrors. So the minimally quicker acceleration over the Carrera S and 4S models is really just a relative thing at the end of the day, just like the 2 km/h-higher or the Carrera GTS’s unchanged ccombined consumption of just 8.7 l/100 km in the New European Driving Cycle (NEDC). What really counts are the impressions, the driving characteristics—in short, the complete experience. In this Porsche, too, the left hand is the beginning of everything, for the left hand slides the key into the ignition and with a twist of the wrist celebrates the surround-sound premiere of the resonance intake system with 6 plus 1 switchable valves, flow-optimized intake ducts, new intake camshafts with greater valve lift, an adapted valve spring package, two switchable exhaust valves, and reprogrammed engine control. The new 911 is offered as a Coupé and as a Cabrio, as a GTS with rear-wheel drive, and as a 4 GTS with all-wheel drive. All models come standard with the shifting force-optimized seven-speed manual transmission; PDK is optional. Granted, the 3.8-liter six-cylinder engine does not push it to the rev limiter at 7,800 rpm in seventh gear, which is set up for optimal consumption and comfort. The hp-upgrade really makes itself felt above 6,300 rpm, when the six valves open the floodgates for the forced-in­duction resonance. But this 911’s dramatic arc between high-revving euphoria, awesome bursts of torque, and seamlessly smooth shifting is most immediately felt in the PDK Sport program, in which the touch of a button has massive effects. Wider, lower, lighter—ideal prerequisites for more agile handling, more grip in the corners, and even better driving performance. Without the optional rear seats, the GTS weighs almost seven kilograms less than the Carrera S, an imposingly solid presence on the road that exudes an extra portion of agility thanks to PASM (Porsche Active Suspension Management, standard with a 10-mm lower body). It adds up to Porsche driving pleasure plus, made up of the parameters style, haptics, sound, and dynamism. You won’t want less 911, and you won’t need more. Nevertheless, the list of enchanting options is worth a glance. It includes Torque Vectoring Plus (standard with PDK), the PASM sport suspension, which lowers the body by 20 millimeters and includes an aerodynamics package, PDCC (Porsche Dyna­mic Chassis Control) roll compensation, and a 90-liter fuel tank option for the rear-wheel-drive variants. For even more range—and the extra portion of GTS driving pleasure. Text first published in the Porsche customer magazine Christophorus, No. 369.
International journalists took them for a test drive in South Africa. Porsche is sending its second generation of the 911 Carrera GTS to the starting line. The new 911 Carrera GTS - All that matters.